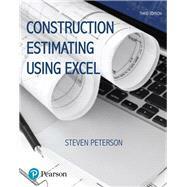 Construction Estimating with Excel, 3/e, introduces readers to the fundamental principles of estimating using drawing sets, real-world exercises, and examples. The book moves step-by-step through the estimating process, discussing the art of estimating, the quantity takeoff, how to put costs to the estimate, and how to finalize the bid. As students progress through the text they are shown how Microsoft Excel can be used to improve the estimating process. Because it introduces spreadsheets as a way of increasing estimating productivity and accuracy, the book can help both beginning and experienced estimators improve their skills. The Third Edition gives students a broader understanding of construction estimating with a new chapter discussing the role that estimating plays in different project delivery methods and in the design process and how to use data from RSMeans. To bring the book up to date, the material and equipment costs and labor rates have been updated to reflect current costs, and the discussion of Excel (including the figures) is based on Excel 2016. Additionally, content throughout the book has been updated to align to ACCE and ABET student learning outcomes. Student resources are available on the companion website www.pearsonhighered.com/careersresources/ . Steven J. Peterson is a professor of construction management at Weber State University, where he joined the faculty in 2000. Steven received an MBA and a BS in engineering from the University of Utah. He is a licensed professional engineer and a member of the Design-Build Institute of America. Steve’s area of expertise is the business side of running a construction company and managing construction projects. He is the author of Pearson’s Pocket Guide to Construction Management (Pearson 2012) and two textbooks, Construction Accounting and Financial Management (Pearson 2013) and Construction Estimating Using Excel (Pearson 2017). He is the coauthor of a third textbook, Estimating in Building Construction (Pearson 2015). In 2011, Steven was named Associated Schools of Construction (ASC) Region 6 Outstanding Educator. This was one of three awards given from regions around the country. The award recognizes someone who contributes to construction education, excels in teaching, and is dedicated to the construction profession. Before coming to Weber State, Steven spent 15 years working in the construction industry. He has worked on the design and construction of hazardous/radioactive waste landfills, numerous multi-family projects, and other commercial construction.